Buying a house, applying for a job, becoming a new patient at a doctor’s office, purchasing a car — all of these things require a lot of paperwork and take a lot of time. Not to mention some fees could be required. Signing up for a dating site, like Match.com, though, doesn’t come with form after form and payment after payment. The site’s goal is to get you on your way and meeting people as soon as possible with as little stress as possible. It only takes five steps to get started, and it’s totally free. The Match process begins by going to the homepage (or downloading the app via iTunes or Google Play) and following the prompts on the screen. This is for a free membership that will never expire. You also have the option of signing up through Facebook, which speeds up everything even more. Some of the big takeaways we want to point out are Match’s size (13.5 million monthly visitors, not to mention 30 million members, in general) and reputation (the most romantic connections of any of its competitors). Whether you want a date or long-term commitment, you’re in good hands on Match. Don’t stress out about answering some of these open-ended questions, such as if you want kids. You can always go to your profile (click your image in the top-right corner of your dashboard) and make edits whenever you want if something in your life changes. Match has you choose your five favorite hobbies, but don’t worry — you can always add more in extra sections included in your profile. Take a look at the screenshot above, and you’ll also notice faces with check marks at the bottom. 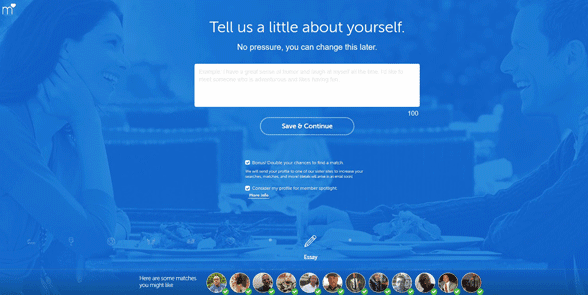 As you’re filling out your profile, Match starts recommending compatible matches right away. The site never stops working for you! 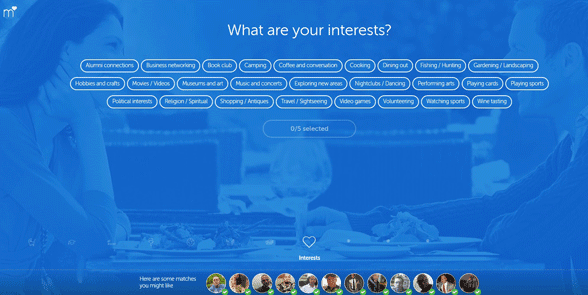 In addition to learning about your personality and lifestyle, Match wants to learn about your ideal date or partner’s personality and lifestyle. In the “Looking for something specific?” section, you’ll see the same characteristics and qualities from the second step (age, height, body type, wants kids, has kids, ethnicity, drinking, education, religion, smoking, marital status, and salary), and when you click one, you’ll choose what your preferences and/or dealbreakers are. For example, if you tell Match marital status is important to you, the options will show up again (never married, currently separated, divorced, or widow/widower), and you can say which types you want to see in your match suggestions and which types you don’t. At this point, you’ll be past the multiple-choice questions — it’s time to say, in your own words, what you’re all about and what you want out of your love life. You must write at least 100 characters, but we’d recommend writing as much as you can so people are inspired to reach out. The “Tell us a little about yourself” part is where you can really express your desires and dreams, so try to go well beyond the 100-character limit. Match has an example sentence if you need some ideas for what to say: “I have a great sense of humor and laugh at myself all the time. I’d like to meet someone who is adventurous and likes having fun.” Below this example, you’ll also see that you can decide if you want to have your profile showcased on the website (e.g., the homepage) and/or appear on one of Match’s sister sites. If you’re not interested, just uncheck the boxes. Free? Check! Fast? Check! Facile? Check! Fun? Check! Match has some other fields you can fill out, such as adding a photo, but the five steps above are all you need to complete. 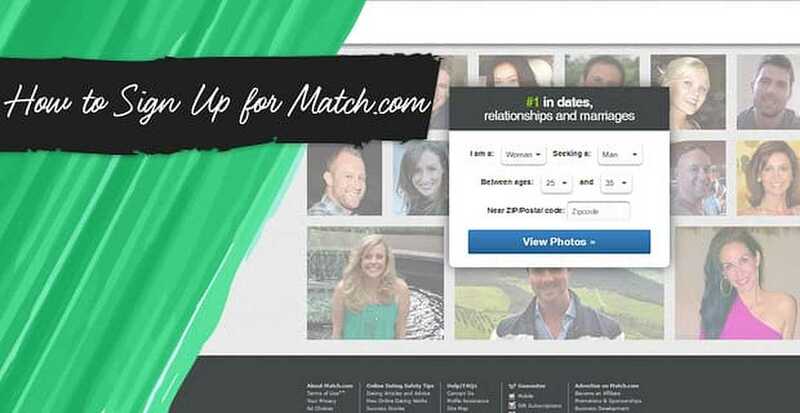 The site will use this information to find you the best matches possible. It will also use your on-site behavior (e.g., who you search for and like) to do so. Some things, like trying to get a mortgage or new car, can take hours or even days, but when it comes to love, there’s no time to wait. Match agrees, which is why the site does everything it can to kickstart your journey.